Babylon takes its name from the ancient city of Babylon , where early calendars were invented. 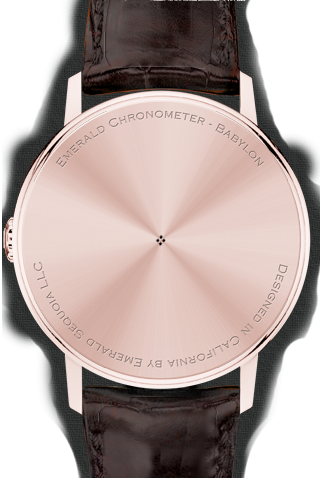 Babylon displays a whole-month calendar in the usual format, including the last days of the previous month and the first days of the following month, while still adhering to our mechanical model. See below for a description of the mechanics being simulated. A setting is available to choose which day (Sunday, Monday, or Saturday) is considered the first day of the week. To change this, tap the "Settings" (gear) button at the bottom right of the screen, to bring up the settings panel; scroll down to "Watch-specific Settings", select "Babylon Week Start", and choose the day you would like to be first. Two sets of red indicator wires (two horizontal and two vertical) move linearly to indicate the current day of the month (more precisely, the two horizontal indicators show the week, the two vertical ones show the weekday, and their intersection shows the current day). 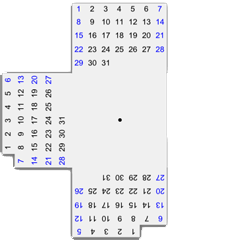 A moon phase indicator like that of Chandra is present at the lower left, along with a month display at the top and a year display at the lower right. In Set mode, the two pushers advance by a day and by a month. You can also drag the hands and tap the month and year windows as usual. 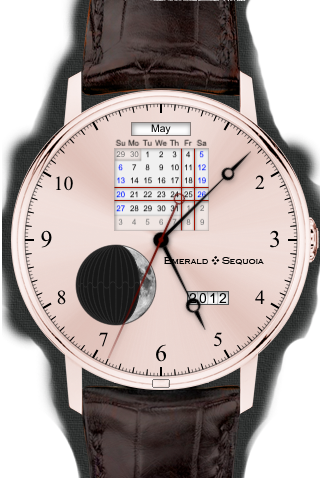 Tapping the moon phase indicator advances to the next quarter. In keeping with tradition in Emerald Chronometer, the transition from the Julian to the Gregorian calendar is shown in October 1582; see the page about controls for how to display that date. 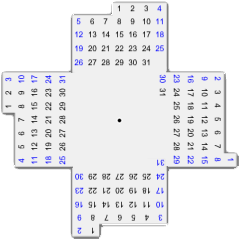 Spread over these two wheels are the seven possible 31-day month configurations, corresponding to the seven weekdays that the first falls on. The bottom wheel shows four of these seven, and the top one shows the remaining three and has a "cutout" in the fourth position. When one of the top wheel's configurations is needed for the current month, that configuration rotates around to be at the top and thus visible in the window; when one of the bottom wheel's configurations is needed, the top wheel rotates so its cutout section is at the top, letting the bottom wheel show through. Above the primary two is a third wheel with a cutout and a special configuration just for October 1582.